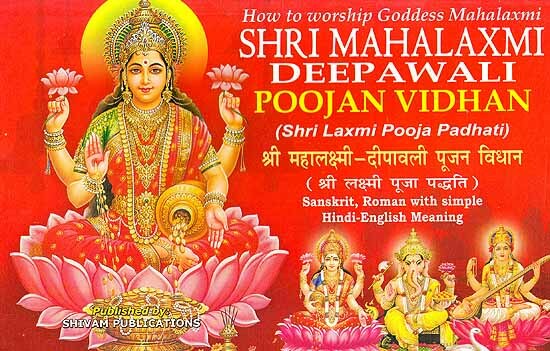 Goddess Lakshmi is venerated as both the embodiment of, and also as bestower of prosperity. There are many instructive legends behind her origin. The most popular one, as delineated in the Srimad Bhagavatam, speaks of her having emerged from the ocean when it was being churned for the nectar of immortality (amrit). When she emerged from the ocean, goddess Lakshmi selected Lord Vishnu as the spouse worthy of her. Thus in her representations, the goddess is often shown with Lord Vishnu. Goddess Lakshmi does not represent ‘money’ in its literal sense. Actually, she denotes a prosperity which both sustains and nourishes itself, i.e. she symbolizes wealth attained through Dharma, and not through Adharma. Dharma here refers to action as prescribed in the Vedic scriptures, whereby the wealth attained is extremely pure. This is one of the reasons why she is worshipped alongside Lord Ganesha on the festival of Diwali, with the latter signifying an obstacle free life, and she representing the boon of bounty. The textual description of Goddess Lakshmi starts with the Rig Veda itself, which is the earliest text in the world. Here, the goddess is described in the famous collection of hymns known as the ‘Shri Sukta’, Shri being another name for goddess Lakshmi. The Upanishads too venerate her, with the Brhadaranyaka Upanishad asking one to identify one’s wife as the goddess Shri. However, it is the numerous Puranas which describe the goddess in popular detail, making her one of the most famous goddesses of India.